It is the beginning of week five – which is an alarming thought. Only this week and next to crack on with uncovering as many of the secrets of the Ness as possible, while still holding an Open Day, on Sunday, and then recording every square inch of the excavation. Help! In the last diary entry, we complained, rather ungratefully, about the infernal Orkney wind, scattering dust and midden crumbs all over newly cleaned surfaces. It is still with us today, but how welcome it is as a cooling agent. The Ness is baking. The sun has shone from the moment we arrived in the morning and already bronzed faces are taking on a new red hue of fresh tan. 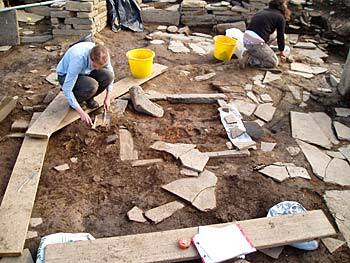 Luckily, veterans of Orkney digs are on hand to remind diggers, especially the young ones, of the vital importance of lathering on as much anti-sun cream as their skin can absorb. It has caused some problems with the digging, of course. The surface of the soil has dried out alarmingly and Antonia, for one, has found it difficult to search for her inscribed stones in such a glaring environment. Photography in such strong light is also an utter pain and, in Structure Ten, Mike is using a garden pressure sprayer to dampen the area in which he is working. It is crucial to identify differences of colour in the soil, which may indicate different episodes of dumping or tipping of midden. These differences, visible on a normal day, disappear from sight when the surface of the soil is dried out, but a light spray helps to bring them back into sight once more. 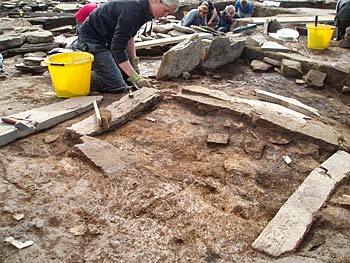 Meanwhile, in Structure Ten, Sarah has continued the excavation and recording of the massive hearth. Vivid colours of various ashy fills are meticulously excavated, recorded and sampled. In fact, it has been a day of hearths, as, in Structure Seven, Georgie has also finally removed the last of the ashy deposits that sealed the hearth to reveal the four hearth slabs. This was matched by Rosie, in Structure One, where a similarly beautiful hearth has also been fully uncovered. This hearth relates to the second major phase of this building, when the large, curving wall was inserted, but is probably based on one of the earlier hearths, relating to its primary use. 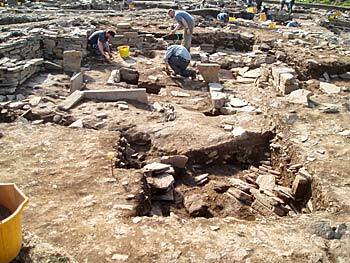 We have been blessed, this year, with a large team of enthusiastic diggers, who have done amazing work on the site. Many are students and we are keen for them to introduce themselves to archaeo-sphere readers and to share their experiences with you. However, we are running out of time to include them all, so today, and for as many days as possible, we are offering you double-blogs from the young folk. Marta and Ian are contributing today – so enjoy their thoughts and we will be back tomorrow. My name is Marta. I’m one of the students attending the MA in archeological practice at Orkney College. One of the most important aspects of our course is the opportunity to think, repeatedly, about the way practice and theory are involved. 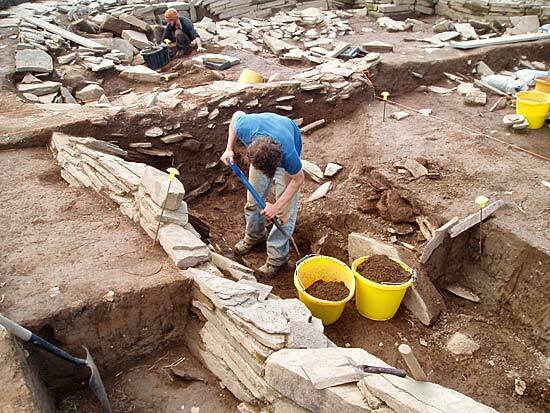 For this reason, all us were looking forward to the dig on the Ness of Brodgar. In my opinion, the first stage of our dig is the experience shared with other people – with the others diggers, students and tourists. Everybody brings a piece of his/her personal background, his/her experience, his/her comments. 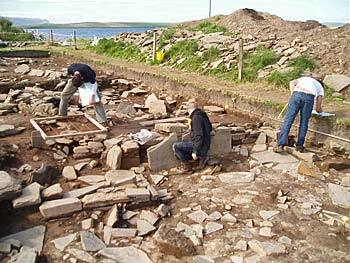 That is really interesting, because we are from different parts of the world (I’m from Italy), and we are trying, together, to read the traces of past life on the Ness of Brodgar. I’m spending most of my time in Structure One, under the brilliant supervision of Dan. One of the interesting aspects of this dig is the approach taken with the diggers. We are asked to give our point of view; we are an active part in the process of understanding what is happening. So thank you for this opportunity; thank you to Orkney College and ORCA and all the diggers for the fantastic work together and for the smiles and the warmth that make this excavation at the Ness really magic. My name is Ian Carr or, as I am more commonly referred to in Orkney, “New York Ian”. I am a senior student at Queens College in the New York part of the City University of New York (CUNY) system. I first came to Orkney last year as a student on the Rousay field school, which was collaboration between CUNY, Bradford University and Orkney College UHI. It was an experience of a lifetime learning from the site directors, Steve Dockrill and Julie Bond. It gave me the opportunity to meet, and learn from, the Orkney College faculty – Julie Gibson, Martin Caruthers and James Moore, to mention just a few of the exceptional archaeologists I had the chance to meet. After three weeks on Rousay, and tours of the surrounding islands, I fell in love with the landscape and the seascape, in addition to the archaeology and the local Orcadian populace. At the completion of the dig, I was asked back for another season on Rousay. I jumped at the chance. You couldn’t keep me away. Upon returning to Orkney, it felt as if I was coming home. The dig went brilliantly, giving me further opportunities to learn and meet world-class archaeologists. Upon completion of the successful Rousay dig, I couldn’t wait to get on to the Ness. I have only been on site for a week and its size and complexity has left me both in awe and honoured to be included in the excavation. The director, Nick Card, runs a clean and efficient site and his team of supervisors are second to none. I have spent my week working under the supervision of Owen, in Structure Twelve. His ability to teach the first-time diggers in a casual, stress-free manner is to be commended. As a volunteer, with some previous experience, he has given me a boost of confidence in my own abilities. His feedback is always helpful and welcomed. He has put his trust in my ability to dig and has faith that I will rise to the occasion. Because of my brief time working with Owen, I feel more capable and confident as an archaeologist. He takes my questions and suggestions and I feel appreciated. Today was my last day digging for this year. Back to New York in just two days, where I will complete my BA in archaeology. 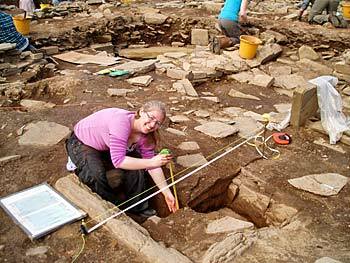 Then its back to Orkney, my adopted home away from home, for another amazing dig season next summer. Following that I will be applying to Orkney College to further the wonderful education I have already received from Orkney College and their associates. Cheers!